Wales are "relishing" the chance to make an impact at next summer's European Championship in France, according to forward Hal Robson-Kanu. Wales have been drawn in Group B along with England, Russia and Slovakia. The top two from each group will go through to the last 16, while the best four third-placed teams also progress. "We're pleased with the draw but fully focused on going there and doing a job," the 26-year-old Reading player said. "Our focus initially will be on getting out of the group but once we do it's a cup competition and anything can happen," he added. "As a group of players we genuinely believe that this is just the beginning and we're really relishing it." Chris Coleman's side will face Slovakia in Bordeaux on 11 June, England in Lens on 16 June and then Russia in Toulouse on 20 June. 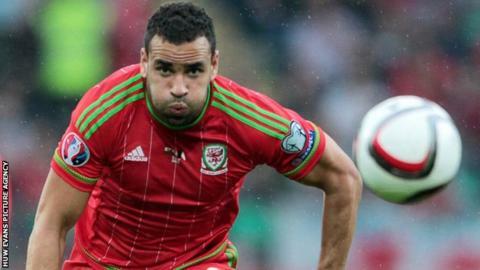 Robson-Kanu was born in Acton in west London and represented England at youth level. He qualifies for Wales through his grandmother and has won 30 senior caps since making his debut against Croatia in 2010. He said he is happy with Wales' group and is looking forward to the game against Roy Hodgson's side. "These are the games you want to play in," Robson-Kanu added. "The build-up to the game is going to be huge for both nations and the hype around it will be exceptional. "The game itself I'm sure will be some occasion but we're very much looking forward to it." Read more on Euro 2016: How have Wales fared against Group B rivals?